This compilation of stories has been put together as a result of interviews, letters and reports given to me by some of the people who were involved in this wonderful story. Our story begins, it seems, well before the time of the development of our reunion grounds through the efforts of such men as Percy Farrow, Bill McMurray and Al Pelletier, who helped prepare the area for organization. However, in the fall of 1957, several Northern Ontario church members were asked by Apostle D.O. Chesworth, to locate a place where they might be able to hold a conference to organize the Northern Ontario District. This conference did in fact convene in October of 1957, being held in the Legion Hall in North Bay and officers were elected to organize district activities beginning in the new year. One of the major concerns of the newly formed district was whether they would have the facilities to provide for activities which would be required, such as camps and reunions. As a few of the Monetville residents were returning from the conference, they were discussing the possibility of a reunion grounds property for the district. Previous to this a few reunions had been held on a piece of property directly across the lake from New Liskeard. Harvey Wagg recalls a fairly good attendance at these reunions, but there was some discussion as to the possibility of a reunion grounds, a little more central in the district. Brother Harold Fryer, as a result of these and other conversations about a reunion grounds, decided to donate to the District a 35 acre piece of property which he owned in Monetville, across from the Greenway Hotel. Although this property was not close to a lake and the nearest swimming location would be a mile down the road at the public park, it was decided that the appropriate steps should be taken to approve this property for the site of the new reunion grounds. Apostle Chesworth came to look at the property and decided that he would inform World Church and see what their reaction would be. World Church approved and permission to use this property as a reunion ground was granted. During the winter of 1958 or early in the spring of ‘59, Helen and Hugh Grieve and Harold and Elena Fryer had obtained lake lots from the Department of Lands and Forests and for their own personal use and shortly after they became aware of another 10 acre parcel of land, with good lake frontage, on Island ‘L’. They and several others, including John Booth who was now the Regional Administrator, went to have a look at it. The access to this property was normally by means of a marshy causeway, but on that occasion it was covered by 1 1/2 - 2 feet of water, so they took an alternative route by boat from the Fryer cottage at Sucker Creek. It was thought that this 10 acre parcel had a few more advantages then did the 35 acre parcel, so a decision was made to apply to the Department of Lands and Forests, to lease the 10 acres. The lease was approved and completed on August 4th, 1959, on condition that there would be at least $3,000.00 worth of building construction done on the land before the 5 year lease was up. If this was done, then the District would be able to purchase the land at the end of the lease period. Shortly thereafter, plans were made for a work camp to convene October 10th - 18th, 1959. The work camp day arrived and work parties were formed. While some workers were transported to the site by water from Sucker Creek, others waded across the water filled causeway with their pants rolled up and John Bradley commented that it was easy to tell how high the water level was by observing where the mosquito bites started and stopped. They began clearing the very dense brush and several thousand feet of timber was cut and transported to the Fryer mill to be sawed and dressed. A road would have to be built and quick, as our sailors were getting tired of their water travel and proper clearing machinery could not be taken by water to the grounds. A stone boat constructed out of oak, had been built and used to haul equipment across the water but this was quickly becoming an inconvenience. A road, crossing a marshy area full of bulrushes, would be the only possible means of accessing the area. Dave Pessah volunteered to be the pioneer of the marshland, and so with staff in hand and wearing only shorts , he stepped out bravely into the unknown. A comment was heard from the shore... "Moses is crossing the swamp". The road brushing began and a chipper was obtained, courtesy of Pat Bolger. The road crew chipped a road through the woods in one day and the way was cleared for the development of the access road. To help with the road, sand was obtained from local sand pits and loaded by hand onto the trucks. John Bradley kept track of the time which all workers contributed to the grounds and he estimated that by this point a total of 150 man-days had been contributed. The district campgrounds committee in the meantime had hired an architect to develop a plan for the grounds. The architect, following on site examinations of the property, decided that the dining hall should be located far enough away from the chapel so that any noise might not interfere with the worship services. The architect’s location for the dining hall was in the exact place it presently stands. It is easy for us now to realize that this is an excellent location for the hall, however, one must remember that all these decisions were made in the midst of very dense bush and very tall trees. A design for the dining hall was considered by Tom Ridley and John Bradley and by June 24th 1960 work on it was ready to begin. Tom did the stressing with the help of a few people from his company John Clark Building Enterprise. Clearing of the dining hall site began shortly thereafter. Jack ‘The Blaster' McCarty did all the blasting of the rock for the dining hall location and the first building was underway. The footings for the dining hall were poured as well as for the first washroom building (where the lower washroom now stands) and blocks were set in place for the dining hall to grade level and above grade level for the washroom. Earl Mitchell recalls leaving Blind River one morning at 4:30 am with a load of 2 1/2” diameter steel pipe 201" long. This was to help in the reinforcing and drains of the dining hall floor. Wood for the dining hall was brought out from Harold Fryer's forest and was sawed into boards at his sawmill. A lot of work, and especially equipment, was supplied by the Fryer family for which we are greatly appreciative. John Bradley's calculations for this work camp was 190 man-days. With the footings and some partial walls in place for these two buildings, another date was set for the next work camp. It was planned for the Thanksgiving weekend in the Fall of 1960 and they hoped that they would be able to get the buildings closed in before the winter set in. On the Thanksgiving weekend the work began again. Two block-layers from New Liskeard were hired and began their work on the Thursday morning. Their job was to lay block to the bottom of the window levels. Jim Renfroe volunteered to be their helper on the mortar mixer and by Friday night the blocks were all in place ready for the carpentry work to begin. John Bradley had drawn the plans for the dining hall and the plans had already been approved by World Church before the building began so now they were ready to go. It is recalled that there were some 40 workers at this camp at one time and the walls were erected very quickly followed by the roof. Earl Mitchell bought wood at Noelville at one point, for the roof of the dining hall. Framing of the roof was directed by Bob McCulloch with many helping hands including carpenter Wes Shepherdson. As soon as the dining hall was closed in, it became the sleeping quarters for our weary workers. Earl Mitchell and Vern Charlton remember sleeping on a sheet of plywood one night in the dining hall and in the morning Vern said ... "I think we slept on the soft side of that plywood!" Plumbing for the hall was under the control of Albert Cosmack and a lot of supplies were furnished by Graydon Fielder from his hardware store in New Liskeard. Some work by this time had begun on the playing field area. Again, trees had to be cut and stumps removed. Earl Mitchell did some bulldozer work in this area and was helped by Lloyd Hopkin and Vern Charlton. A few days work was originally planned but workers ended up being there for 8 days clearing trees and digging up and loading stones and stumps into a truck. Leonard Dokis also helped with his bulldozer. Leonard was another one who had only planned on staying 2 days but ended up staying 8. The stones and stumps were transported to the causeway to help build up that area. Jim Renfroe was one of the first work camp directors, even though he admittedly was unsure of the steps necessary to complete the huge task. Many were asked for advice and all volunteered their expertise and knowledge. Other helpers in those early days included a friend of Jim's from Kentucky, Gary and Marguerite Mitchell and friends of theirs from Spanish, Levi Fournier and Alex Ferguson. Marvin Wickett was a regular helper and several came from Manitoulin Island, including Harold Case and Willis Hopkin. Upon completion of the dining hall, except for the windows, the next project was already underway. The lower washroom was about to become a much needed reality. Harvey Wagg did some scrounging at what used to be White Rose Oil Co. and supplied much of the hardware and plumbing needs. Harvey and Albert Kosmack had a lot to do with the completion of this building. Albert Kosmack was the chief plumber. He was part owner of Kosmack and Price Plumbing and Heating. The weather was great for this camp and a lot of work was completed. Not all the time was spent in work however, as Harvey Wagg recalls. Apparently there were times when the weary workers still had time for some fun. Does anyone remember John Booth challenging everyone on site to an 'Indian Wrestle?' Does anyone remember beating him? It seems none of our strong northern boys could put the push on ol' John until Ron Sagle, who was apparently the closest to being able to beat the champ, arranged a little board leverage with Lloyd Hopkin and the champ was down for the count. How did this place ever get built with all this fooling around? In December of 1960 a conference was held at Monetville and another work camp was planned for June 16th 1961. A date of July 1st - 8th, 1961 was also set for the first Youth camp which would be held on the new grounds along with a weekend date of September 2nd - 4th of that year for the first reunion. When the date of this work camp arrived, many finishing touches were added to the shells of buildings left from the year before. Windows and doors were installed in the dining hall and washroom and the cement floor was poured in the dining hall. As well, water and hydro were hooked up, cooking equipment was installed, toilets, wash basins, weeping beds and septic tank installations were a part of this camps accomplishments. The work camp was a busy place and all the buildings were in good shape for the beginning of the first camp and reunion activities. Harvey Wagg said that “During the early period of construction, there was a fine spirit of fellowship which was enjoyed by many through dedication and sometimes sacrifice. This proved to be the deciding factor in the success of the building and development program. While there wasn't a lot of time to relax, when it did come, it was thoroughly enjoyed by all the people who joined in softball and volleyball games and Indian Wrestling and sometimes dips in the lake, whether these dips were taken willingly or forcibly. I recall that Jack McCarty was one of the fellows who took several dips without his permission. The first camping experience in the area was held at the Fryer's Sucker Creek cottage in 1958. Sleeping tents were erected as well as a large eating and meeting tent. Claire Shepherdson of New Liskeard was camp director and there were approximately 90 campers and staff in attendance, much to the amazement of the camp organizers. On July lst, 1961, the first ON-GROUNDS youth camp began. Jim Renfroe was the director of this camp. The year was 1961, the date September 2nd - 4th, and the first reunion experience was under way. A gold star has to be given to all who endured the days of the tent classrooms and the rain, and the rain, and the rain! But the beauty of the grounds and the surrounding nature made up for the inconveniences of accommodations and weather. In attendance at the first weekend reunion was Joe Yaeger and E.Y. Hunker from World Church. John Booth was the reunion director and Jim Renfroe was in attendance as the World Church appointee for Northern Ontario. The first week-long reunion was held in the summer of 1962. Each facility was used for their normal function but the dining hall doubled as the chapel as well. Services that week were held in the end of the dining hall where the fireplace now stands. 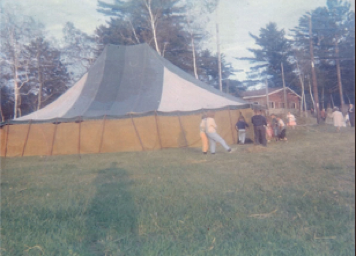 In 1962 camping experiences also changed slightly to provide for a Senior High and a Junior High camp as well as a Young Adult retreat held on the Thanksgiving weekend. These camping experiences have become a tradition on the grounds and in recent years have been expanded even more to provide for Skylark, Oriole, Boys Camp and Native camps, to keep the tradition alive and moving forward. In the Fall of 1962, construction began on the chapel. Clearing of the area became the responsibility of everyone and as Dave Pessah put it, "All became specialists. We knew everything about everything then." All of the workers took turns at blasting stumps out of the ground. "Some stumps are still orbiting the earth, you know!" said Dave, "Too much of a charge !" The footings were prepared by some, while Harold Fryer assisted by Morley Shepherdson walked many hours through the bush looking for straight, tall and uniform trees that would make up the 50 foot rafters. (the trees in fact had to be 50 - 55 ft tall). Harold Fryer's next large task was to get these trees out of the bush on a truck and haul them to the campgrounds for them to be peeled. He and his sons assisted in this chore. Many people recall the peeling process. It is thought that without the help of Edith Pessah, Francis Shepherdson, Leila Wagg, Ken Flanders and many others, there probably wouldn't be a chapel today. These fine people stood or sat in the lake for a whole week and peeled the bark off the logs. After they had peeled the bark, they treated the logs with a stain before they were suitable for the interior and exposed rafters of the chapel. While all of this was happening at the lake, others poured the footings and formed and poured the pallisters for the tree rafters to stand on. Jack Grieve assisted in the mixing of the cement for the footings, while Gary Mitchell helped in the pouring of the footings which was all done by hand. Apparently there were two mixers on the go steadily. Marguerite Mitchell recalls wheelbarrowing the cement from the mixers to the location of pouring. Dwight Fryer recalls the erecting procedure for the chapel. He says that a winch of sorts was attached to a tree behind the chapel (that tree is now gone). From there the rope went out to the first section of A-Frame which had been constructed on the ground. The ends of the first rafter were lifted onto the pallisters or piers where spikes were already embedded in the cement on the top of each pallister and a hole had been drilled in the bottom of each rafter to accept the spikes. A tractor was hooked up to the one end of the rope, while the other end went through the pulley attached to the tree and was hooked to the top of the A-Frame rafter. The tractor then began the pull while all watched in anticipation. Slowly the A-Frame section rose from the ground higher and higher until it reached the place where it should stand. A second safety rope was keeping it from toppling too far the other way. A few positional taps with sledge hammers and the A-Frame ‘Thumped’ into place. What a sense of accomplishment they must have felt as this sacred building began to take shape. Dave Pessah recalls a very memorable experience for him. He recalls climbing up that big tree behind the Chapel and attaching the first A-Frame section to the tree with a 2X6. Then as each section came up, he would crawl out on the previous section and fasten the next to it with another 2X6, until all the sections were in place. Thus ended another long and difficult, but successful work camp. In 1963 the Reunion Grounds saw a second week-long reunion. The chapel was not completed yet but the rafters were all in place and there they stood for all to see, the majesty of what was to be. A large tent was erected to hold church services and this tent stood below the upright rafters of the future chapel. These beautiful grounds were beginning to take shape and the news of this place spread far and wide. Many people from all over Ontario and some of the northern states travelled to share with the saints of Northern Ontario. This area would never be the same! In the fall of 1963 or the spring of 1964, another work camp convened to continue working on the chapel. The roof had to go on next. The lumber used was 2” X 6” X 1 1/2” thick pine planking which Earl Mitchell bought from McFadden’s Lumber Mill in Blind River. Earl recalls driving his truck the 150 miles over very poor roads, (some of us remember the early roads, don't we !) fastening the wood on his truck with bear clamps and then driving 150 miles back to the grounds. Earl paid for the wood, $1,316.00 cash and was reimbursed by Harold Fryer on his return. When more wood was needed Earl was asked for the cheque back again in order to purchase the second load of wood. This time a Fryer truck made the long trip. “In those days that height was nothing”, said Dave Pessah, as he described the constructing of the chapel roof. "We just ran up and down those walls." As the workers neared the top, the regular 2X6 boards would not fit, so Roger Fryer cut some lumber to fit along the top. While some were running up and down the sides of the chapel, Andrew Beaudin recalls a couple of our early workers who were not quite as enthusiastic. Andrew recalls John Booth, alongside his wife Margaret. The higher John went, the tighter his grip became, until finally he was holding on so tight with both hands that he wasn't able to move in any direction. Much to his chagrin, he looked to his wife Margaret, but she was so busy working and apparently undaunted by the height, that she didn't even notice his plight. The shingling went on next while Don Mitchell, Jack Allison and Harvey Wagg worked on the wiring inside. Jack Allison and a couple of helpers installed the main conduit line in the chapel at this time as well. And again time had run out on another long and difficult work camp. The 1964 reunion was the first one held in the chapel even though it was still not completely finished. Plastic had been stretched over the ends of the chapel to keep the moisture and wind out. The reunions were growing considerably in size each year and the facilities were being taxed to their limit. In the fall of 1964 or the spring of 1965, the ends were finished on the chapel and it was ready for regular use which included reunions, camps, retreats and weddings. In the fall of 1965, the District received the good news that they would now be able to buy the property. A letter from G.W. Turnbull of the Department of Lands and Forests informed us that the price was calculated at $2.50 per foot of frontage. The grounds had 884 feet of frontage and the price was calculated at $2,210.00 . Payment was made and the deed for the property was received a short time later. Not long after this the district began negotiations for additional property behind the original 10 acres. "There was about 19 acres behind, which we were interested in at the time. ", recalls Harvey Wagg. Eventually this property came into the possession of the grounds. While the crews worked long hard hours on site, much loving support and help was given to them by the ladies who prepared food at Fryer’s cottage and brought it around to Fryer's Point for the men to eat. Some of the cooks were Leila Wagg, Laura Martineau, Joy Hopkin and Rita Smith. We would find it next to impossible to name all the ladies and families who were involved in the building of the campgrounds but several families were there continuously. Harold and Elena Fryer made their Sucker Creek cottage available for cooking and sleeping. Hugh and Helen Grieve opened their home for cooks to sleep in and Helen made many trips to where the cooking was being done and to the grounds with food and baking. She also helped the other ladies with the cooking and delivering of the food as well. Jack Grieve also made his cottage available to women who came to cook at different times and who had small children. and grill to make it possible to serve and cook meals. The Monetville congregation let us use their church, the women cooking in the basement and the men sleeping upstairs. There wasn't any water in the basement of the church at that time so the men had to bring it to them. There was no refrigerator there either, so the leftovers were taken to Helen Grieve’s place for the night and then returned the next day. The leftovers ended up in someone's lap on the trip to the church”. At one point, the women were trying to cook without an oven and the women of the district offered assistance by sending pies, cookies, cakes, and canned fruit in abundance. The women worked at many other jobs around the grounds as well from peeling the logs as mentioned earlier, to yard work, painting, making curtains and cleaning buildings in preparation for camps and reunions. Before the dishwasher arrived, the women recall washing dishes, and more dishes, and more dishes. Leila recalls many young people helping out here and she said the ladies were very grateful. In the early days, Dr. Margaret Booth kept men and women in good working condition with Osteopathic Treatments. On another occasion the women put pine cones in the men's sleeping bags - so in retaliation, the men hard boiled the eggs they thought the women would be trying to fry up for breakfast the next morning. As the men huddled around the stove the next morning to watch the reaction of the women, they became very disappointed when not one of the hard boiled eggs was broken. The women apparently always took the eggs they were going to use the next morning, out of the fridge the night before so they would be at room temperature. The men had boiled the wrong ones! On one unforgettable Thanksgiving, the women forgot to boil the pails of potatoes which they had peeled and set outside the cottage, and on another occasion, the men coaxed unwilling women into Roger and Lucy's boat for a boat ride so that they could make a surprise supper while the women were gone. This would have been a nice surprise except that there were a few women who were afraid of water and didn't want to go. The surprise was foiled again for the men, but the supper preparation, a reward for the hard working women, was a nice treat. One cold fall day, the men were doing some work with gravel. Remember guys?? The women knew it was better to mix cement with warm gravel, so when the men came in for lunch that day, they found pans of gravel heating in the ovens. That must have been a yummy lunch? Leila Wagg ended her memories with these comments... "As I look back over those years, I feel they were some of the most productive and rewarding days of my life. The love and fellowship of many women and men as they worked hard together, is something I will never forget. To see the change in the lives of people as they attended retreats, junior and senior high camps, Oriole and Skylark camps and work camps, has been rewarding. Playing a part in the building of the camp grounds is an experience I am glad I did not miss." Thanks a lot ladies!! From all of us!!! Over the years, additional buildings have been added to the original three, as described above. The water system was changed from pumping from the lake, to a well system and holding tank. While drilling the well, John Bradley recalls the workers were given a bit of divine direction. Red Butler was down the well while the others stood around the top looking down. While working, a storm approached, but the men, having worked in such conditions before, didn't give it a second thought. All of a sudden there was a loud clap of thunder and a lightning bolt hit the metal tripod above the well. A few were thrown back and others felt a tingle. John Bradley spoke with conviction, as he said that if God wanted them to stop working that badly, they should listen to Him. "I would mix a batch of cement, pour it into a bucket and hand it up to the boys on top who would reach down and lift it onto the roof. As I reached up as far as I could some of the cement would slop out and fall on me underneath. Needless to say, by the time the roof was finished, I had a thick coating of cement all over my work clothes. It was partly set. If It had fully set, I'd likely be standing by the cement block building yet." On top of this building was placed a huge wooden holding tank. In time, this system was replaced by a larger well and a more adequate pumping system. In later years Don Mitchell designed the now existing fireplace and organized the completion of it. The cement block work was completed by Horst Schiel and the stonework by Harvey Wagg. Don Mitchell also designed the A-Frame dorm (boys dorm) located by the camp sites. Another washroom was built near the tenting area, which was shortly torn down and replaced by another in just about the same location. The Children's Centre has served as classrooms and dorms. It was estimated that the total cost of the original 3 buildings was in the $20,000.00 range. The only labour hired was 2 block-layers from New Liskeard and Jack Allison and his 2 helpers, who installed the main conduit line in the chapel. All the rest of the work was completed by volunteers.
" Good things have been happening at the grounds ever since, with yearly improvements in buildings and in camps and reunions which have been a great help to hundreds of souls over the years. The blessings given, the sermons preached, that closeness to God achieved, and the hearts that have been touched, have been like a pebble dropped in the water with ever widening circles that have influenced many lives to an awareness of God's purposes for them as a people." What has been accomplished by these men an women for our benefit is certainly amazing and without a doubt beautiful!!! How it was accomplished is no less than fantastic and unbelievable ! ! ! We all thank each and every one of you, who helped in any way!! Click here to view stories of the development and construction of the Reunion grounds by and about those people who have left us this wonderful legacy.